Flowers are symbols of God's love and beauty on earth and so are weddings. The flowers add perfume and color to the occasion and are an integral part of any wedding. In fact, flowers in a way guide your wedding, right from the first candlelight dinner, to the proposal, the wedding day and during the reception. 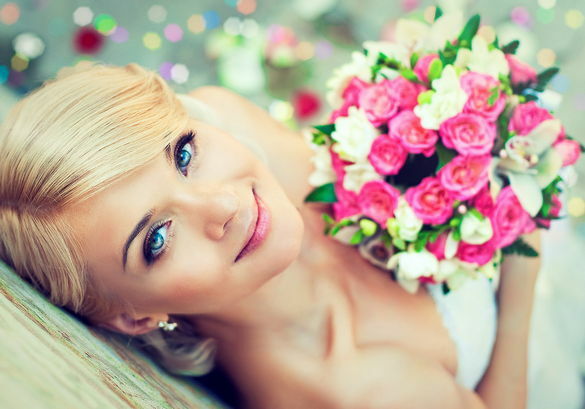 You cannot imagine a wedding without flowers, flowers are so important during weddings. Flowers also find place in weddings as wedding favor gifts and in the wedding reception decorations. Moreover, when you are opting for an Eco friendly decoration theme at your wedding, there really is no better option than flowers. Thus, it is important that the right flower arrangements be made with the right florist. Finding the right florist can be a confusing search, and so this article intends to share some of the aspects of wedding flowers with you. The first step for the bride is to decide on the flower. There are so many flowery options available, but there are certain conventions of the florists that should be followed. For instance, some flowers are especially used at funerals; you have to find flowers that are exclusively for weddings. The best possible approach to this beautiful confusion (flowers are always beautiful) is to rely on your imagination and decide on a flower vision for your wedding. Whether your vision is sketchy or definite, it will be of great assistance to you when you consult the florist. When you consult the florist, tell her of the idea that you have in mind and see how far she is able to understand your idea. Take color swatches, fabric swatches of your wedding dress and the color of the decoration at your wedding reception hall. This is important, because it will help the florist to suggest a flower color combination that goes best with your imagination and to the wedding venue. Also, consult the florist on flower gift ideas. Flowers are a very beautiful gift to be given as wedding favor gifts and bridal shower gifts. Though conventional, yet they are never passe. The vintage and classic appeal of flowers has always complemented the traditional appeal at weddings. First step is to find a specialist wedding florist. Florists are often specialized to handle different occasions like birthdays, prom night celebrations, funerals and weddings. When you are seeking the florist, you have to ensure that your florist is specialized in handling wedding flowers. It is even a better idea to consult with two or three florists at a time, to have your options open. When consulting the florist, what you have to ensure is that the florist is an understanding person to what you are asking of her. If a friend has referred you to a florist, then too it is important to understand whether the florist understands you or not. While consulting the florist do not get disheartened if the florist suggests you a decoration budget that is beyond what you have kept aside for the flower decorations. You should be able to insist that creativity can even transform a low budget decoration into a fabulous decorating space. Thus, the point that you have to pinpoint while you are seeking the florist is the creativity of the florist. Creativity comes with knowledge, so you have to find the florist who is knowledgeable with flowers. Ask the florist about different flower decoration styles (like the Japanese Ikebana or the simple Elizabethan bouquet). It is crucial that you have done a little bit of flower homework for the purpose (otherwise, you will not be able to ask questions and justify answers). The response of the florist to your questions about flowers will tell you whether the florist is creative enough or not. In addition, look at the photos of different wedding decorations that the florist has done before and find the photo that is nearest to your imagination. Suggest what alterations you would like and see whether the florist is able to comply with the alterations or not. Also, check on the factors like how many weddings the florist is attending on your special day. If you're looking for precious flowers like orchids and special flower decorations like arches and exotic potted plants for the reception decoration, then confirm whether the florist can provide them or not. Season is a very important aspect when it comes to flowers, weddings and wedding favors. The availability of flowers vary from season to season, so keep in mind a season check when you are looking for flowers at your wedding. In fact, wedding favor theme gifts are also arranged according to the season. Such wedding favor or bridal shower gifts can be like winter wedding favor theme, summer wedding favor theme or a spring wedding favor theme. If you're deciding on an Eco friendly wedding as your unique wedding idea, then go with it. Flowers are an integral part of any Eco friendly decorations and so you have to pay key attention to the flowers. Consult your decoration ideas with your florist and see that whether the florist can fit in the decoration idea within your budget limit or not. Pay heed to the altercations suggested by the florist and suggest your own changes to the florist's ideas. Recycling the flowers is also a very Eco-friendly idea. Wedding flowers can be classified in different categories and for a perfect floral arrangement the synchrony of all the ingredients are needed. First category is the bouquet that the flower-girl, bridesmaids and the bride will be carrying. Consider bouquets as a fragile fashion accessory and find the bouquet that rightly fits your aura. The flowers in hand should be able to add to the grace and beauty of the girl who is holding them. The bouquet is like a friend when you are walking down the aisle. Another category is the decoration at the reception and at the church. The extent and design of these decorations depends upon the consultation between the florist and you. You can also plan arches, flower themes and wedding favor flower gift ideas at the time of deciding the decoration idea. Inform the florist at least five months prior to let her prepare the seasonal wedding flower arrangements perfectly.